Angela Marie's latest novel! Available on Amazon! Hey readers! I had the opportunity to interview fellow Catholic author, Angela Marie! If you're looking for fairy tale romances with faith based plots, you've come to the right place! Owning most of her books myself, I can attest to their originality, suspenseful plots, dynamic characters, and happily ever after endings! 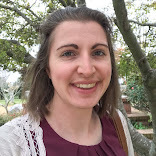 Check out what inspired Angela Marie to become an author, her favorite books and characters, and advice to aspiring writers! Click here to view her books and see her book trailers here! My eldest sister always wrote fictional stories when we were growing up. Even before we started using the computer to type, she would have stacks of notebooks filled with humorous and exciting handwritten stories that she would let us read. I looked up to my eldest sister and wanted to imitate her, so I began writing stories too. And I enjoyed thinking up new characters and plots so much, that I’ve been writing ever since! It was my eldest sister who strongly encouraged me to look into self-publishing options after I wrote the first five volumes of the Catholic Kingdom Series as a birthday gift for her in 2013. Now my eldest sister and I make a great team; she helps me to think of ideas for new stories, along with giving me invaluable input for scenes. She and my youngest sister–my #1 fan–also provide me with indispensable “prayer support.” None of my writing endeavors would go so well without the continued kind intercession of Our Lady of Good Success, St. Vincent Ferrer, St. Jude, St. Michael, the holy angels, and so many others!! 2. What is your favorite book that you have written and why? Impossible to answer! I honestly like them all, in their own way. The Catholic Kingdom Series began my self-publishing efforts, so that makes it rather special. Night Falls Over Sol took a “darker” direction that I thoroughly enjoyed–such a fun mixture of “drama” and humor in that one!, while To Fynde a Husband started out as a little “something” that my youngest sister and I were going to write together. We came up with the initial characters and the first couple of chapters, and then I got stuck, and I had to set aside that project to work on something else; I later returned to it with my eldest sister, the two of us surprising our youngest sister with a completed book for her birthday. I really enjoy how that unique, lighthearted tale turned out. 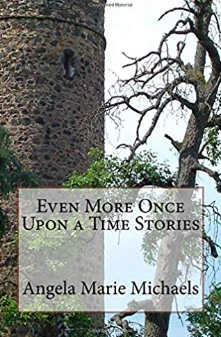 Once Upon a Time Stories marked a new phase in my writing. I’m extremely pleased with those first two parts and how my writing improved with each new volume of the “fairytales retold” series. The five books of the Evangelistae Kingdom Chronicles comprise my most “epic” story. The Catholic Colonies was something quite different from anything that I had been writing up until that point and it was neat doing a “mysterious” plot; I loved the strained relations and conflict between two of the main characters. Lastly, I consider my most recent standalone novel, The Prodigal and the King’s Daughter, to be my “masterpiece,” Dei gratia. You’ll soon see why! It will be officially available on Amazon in mid-April of this year. 3. Who is your favorite character from your novels and why? That’s really hard; I have so many characters, and they all have their different personalities. They do fall into certain categories though, and I have to say that I find it the most fun to write the blunt, tactless, short-tempered type of characters, such as Ross (from Once Upon a Time Stories), Macaire (The Evangelistae Kingdom Chronicles), and the Prodigal. Why? I think because they add another level of emotion to the scenes, and get to say some of the best lines. That being said, I love it when all of the different characters interact and react to each other. 4. What is your favorite book that you have read and why? This is much easier to answer! My favorite fictional book is Enemy Brothers, by Constance Savery (1943). I love everything about it: Miss Savery’s excellent style of writing, the plot, the characters, and Dym is my absolute favorite fictional character ever,–never to be topped. Honorable mention goes to Bond and Free by Jean Connor (1913). That one’s a gem! 5. Who has been the most influential author in your writing? My eldest sister, first and foremost! Then, some of the greatest Catholic authors of the 1800’s and early 1900’s: Eleanor C. Donnelly, Fr. Francis J. Finn, Mary T. Waggaman (Shipmates is another gem! ), Meriol Trevor, Fr. Lasance, and the Very Rev. J. A. Keller, D.D. (with special mention of Jean Connor for Bond and Free). Also, Constance Savery: specifically for, Enemy Brothers,Reb and the Redcoats, and Emeralds for the King. My sisters and I love to read a lot of “old books.” What I read affects how I write, so I’m always careful about what literature I look at when working on a project. I often turn to the authors that I mentioned for inspiration. 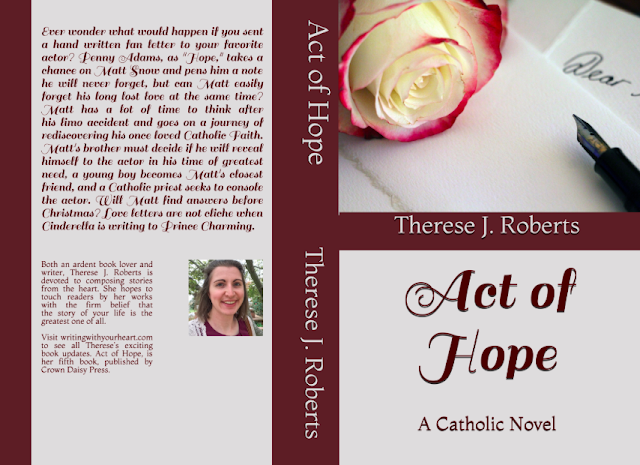 And, speaking of inspiration, Therese, it was hearing about your latest novel, Act of Hope, which providentially inspired me with an intriguing idea for a plot that led to the writing of The Prodigal and the King’s Daughter. Thanks bunches! 6. How does your Catholic Faith contribute to your writing? 7. What advice would you give to someone who wants to be an author? Why do you want to be an author? If you love to write, then write! If you think that others would enjoy reading your stories,–that they’re really good and worth printing, and you want to share them with a wider audience, then self-publishing is a great way to make your books available to the public without any hassle. I have found CreateSpace, now KDP (Kindle Direct Publishing), to be the most reasonable, free, and easy to use service provided at the moment; the major plus for me is being able to have full control over my own works. There’s no harm in trying to show your manuscript to a big publishing company, too, if you want to go with that route. On a more serious note, I would add: Every word that we authors pen and publish will be marked down either for or against us at our particular judgment. For the sake of your immortal soul, never write anything that would offend your guardian Angel, ever at your side. And last of all,–(and this is simply a personal quibble of mine): When formatting a book document, always justify your main text! Thank you, Angela Marie, for your inspiring interview! Look for her next novel in April! In the traditional liturgical calendar, there is a season called Septuagesima, or 70 days until Lent. When I first discovered this, I was intimidated by the extended length of the Lenten season. There is an extension of Lent? Isn't Lent long to begin with? There is such a thing as a pre-Lenten season? I admit I had all of these questions in my mind because I didn't understand. The more I thought and prayed about this beautiful season called Septuagesima, the more I realized the wisdom of these liturgical days. When we come upon Ash Wednesday with no thought of Lent or Easter before this day, we are completely unprepared. How many of us say, I still don't know what to do for Lent, or I guess I'll have to do the same as last year because here Lent is already?! The purpose of Septuagesima is to prepare our hearts and minds for this great season of Lent. This season reminds us of the significance of being prepared. This is a very important aspect of our lives...and of our deaths. We want to be prepared for when we will meet the face of God...whenever that is...and also to meet Him at Easter with peaceful hearts...hearts willing to sacrifice for Him. Let us use this old season of Septuagesima...sadly lost in the new calendar...to truly make this Lent our best yet, by preparing beforehand and knowing truly how to please Our Lord this season. Think about it? What goes wrong when we aren't prepared? Everything! Tomorrow is the feast of Our Lady of Lourdes. This title of Our Lady is a particular favorite of mine. I am drawn to St Bernadette's simplicity and grace that attracted the Blessed Virgin to appear to her. Our Lady's message remains the same in all her apparitions...prayer and penance. I love how Mary and Bernadette prayed the rosary together in these visions. I love how Our Lady came to heal as well, allowing miracles to take place at the Grotto. I love the significance of the visions of 15 days...15 decades of the rosary. And above all the Virgin's saying to Bernadette, "I do not promise you happiness in this life, only in the next." The visions at Lourdes give so much cause for hope...the care of Our Lady for poor sinners and those who are sick. Mary, in revealing herself as the "Immaculate Conception," shows her deep union with God being without sin. Her love for us extends magnanimously by her purity and grace. Our Lady of Lourdes calls us to higher virtue and sanctity, while at the same time, has compassion and pity on those who invoke her aid. St Bernadette lived a hidden life from the world following these apparitions. Her humility is astounding and her joy and peace in the midst of suffering even more so. St Bernadette declined the miraculous springs of the Grotto, and united herself intimately with Christ on the Cross through intense sufferings of tuberculosis. I hope to have the privilege of going to Lourdes one day. The Virgin's title of Lourdes holds a special place in my heart. Our Lady of Lourdes, pray for us! So . . . when is this novel really coming out? 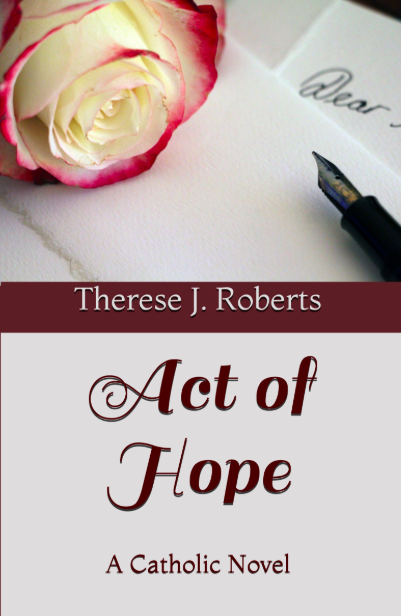 I am VERY excited to share that Act of Hope is now complete! It is available for purchase on my blog here or on Amazon. I would love to hear your thoughts about the cover design, and check out a sneak peek of the first chapter! “I decided to send him a letter,” she said thoughtfully and looked out the window of their apartment. The traffic was backed up all along the highway in Los Angeles, California. The young woman noticed a little red car in the row near their building. “What?” Ruth said to her cousin. “Don’t you like the sound of an old-fashioned fan letter? One you get in the mail?” Penny asked with a note of excitement in her tone. Penny looked out the window again. The traffic had not moved. She stared at the same red car. “I have to get to work now,” Ruth said as she prepared for her evening shift as hotel manager. She could conveniently walk to work. “I hope you have a good night, Ruth,” Penny responded absentmindedly. Penny sighed as Ruth closed the door of their apartment. Penny, who never listened to her cousin, turned the television on once Ruth left the room. She flipped the channels until she found a broadcast that offered an update. Penny clicked off the television and leaned back on the pillow. “Matt Snow . . .” she whispered. Then she walked with determination to the desk in the corner and pulled out a sheet of stationery. It had roses along the edges. She scribbled the pen on a piece of scrap paper to get the ink to run down to the tip and then commenced writing her letter to the injured actor. My cousin says you will not appreciate an old-fashioned fan letter . . . but I want to prove her wrong. I know that your following is great and your messages so frequent that a simple note written on a piece of paper may seem meaningless, but what if it is not? What does one write to their favorite actor at such a difficult time? I can say I’m sorry and feel your great loss, but those are simply words. No one can feel what you are feeling. No one can say they understand. I saw on the news that your accident was very severe. You must be thinking a thousand thoughts right now of how life will be different. Don’t think, Matt. Just live each moment one at a time. You will get better. I know you will because I asked God to make you better. Don’t give up! Penny held her writing instrument in mid-air. “Hmm . . .” she said meditatively. “How should I sign this?” Penny suddenly smiled to herself and finished her letter. She knew someone who worked at the hospital that was going there the next morning. Penny sealed the envelope and made her way to the entranceway of their apartment. Her neighbor down the hall received a knock at her door. Early the next morning, a young priest in a long black cassock was standing outside an occupied hospital room, watching a motionless patient inside. He had given the famous actor the Last Rites the night before on his way into surgery. The emergency operation pieced him back together but there was no question—the legs were paralyzed—at least for the time being. “Father Charles,” a short, middle-aged woman with curly blonde hair suddenly said. The young priest with dark hair roused himself. “I’m sorry, Pat.” He turned and tried to focus on the nurse in front of him. “You have done everything you can for him, Father,” Pat Covington said encouragingly. Father Charles shook his head. Father nodded again. “Thank you, Pat. Please let me know if there’s any change in him.” He walked away slowly. Pat entered the room and closed the door behind her. She approached the bedside and checked the vitals of the unconscious patient. She read the previous nurse’s chart noting his stable condition post-surgery. The actor had been in and out of fits of pain with no obvious improvement in his legs. Pat returned the chart beside the hospital bed and looked over the patient. He was scratched up badly and had a broken arm, ribs, and shoulder. His usual perfectly arranged dark hair was a complete mess. Pat administered more pain medicine through his IV, which brought no more than a slight movement from the patient. After finishing up and writing notes on his chart, Pat left a hand written letter in a sealed envelope on the side table. Upon closing the door again, Pat nearly crashed into Ivan Clark, Snow’s manager. “Excuse me,” she said. “You’re excused,” he returned rudely. “What’s going on in that room?” he demanded. “Same as it was an hour ago and the hour before that,” Pat said, trying to be patient with the overly polished man before her. “Well, what’s the doctor’s verdict about it?” Ivan raised his voice. Pat said testily, “The doctor is down the hall,” and pointed in the opposite direction. She walked away with that statement. Ivan Clark barely glanced in the room of the actor and flew down the hallway in the direction of the doctor. Upon finding him, Ivan presented the same question, “What’s your verdict?” he demanded with his arms crossed. Dr. Morgan stiffened. “I said I would speak with you half an hour from now. I’m in the middle of taking care of another patient,” he said as he took a chart from one of the nurses at the station and began looking it over. “A meeting in half an hour is not good enough. Our production team was supposed to be underway yesterday,” Ivan practically yelled. “Snow’s god is fame and money,” Ivan said flatly, his eyes cold. “As far as I’m concerned, no one needs him any longer,” Ivan said. The doctor shook his head in amazement as the manager walked away down the hall. Ivan turned the corner and bumped into a hoard of reporters. “Back off you leeches!” He brushed past them and went into an empty waiting area. The phone started dialing as he held the receiver to his ear. “Get me Craig Evans,” he demanded. “You almost died!” the boy said with eyes wide open. He was holding a small notebook and pen, waiting for the right moment to ask. “Did you pay attention when I said my middle name? Just like your first name!” Billy said, hardly containing his excitement. Billy glanced down at his notebook again and fingered the outside. “How many signatures do you have?” the man with dark hair wanted to know. Billy looked into the deep brown eyes of the actor. “You will be my first,” he said simply. Matt no longer noticed Billy. “My legs!” he cried out again. “Oh no, something’s wrong,” Billy said. “I better push the special button.” The call button for the nurse started blinking and the boy’s mother came in a few seconds later. “What’s going on?” Pat said quickly. Matt was breathing heavily. “Billy, wait for me outside the room,” she said to her son. Billy closed his notebook and walked to the door, exiting quietly. “Mr. Snow, please calm down. You are not helping yourself.” She checked his vital signs. “Calm down? Calm down? I can’t feel my legs! They won’t move!” His eyes were flashing. “Lucky? You call this lucky? I can’t get up!” Matt yelled in frustration. “My . . . my manager . . . where is he?” Snow suddenly asked. “Where is Ivan Clark?” the actor demanded. Matt followed her gaze. The boy’s face lit up at the recognition by the actor and he waved. Matt looked up at the ceiling again. “You also have a letter beside you from a person who seems to care a lot about you,” Pat added. “From two million fans to two single fans,” the actor murmured to himself. “You are going to be all right,” Pat repeated, trying to reassure him. Matt was still staring at the ceiling. “Read the letter, Mr. Snow,” Pat said and left the hospital room. My cousin says you will not appreciate an old-fashioned fan letter . . . but I want to prove her wrong. I know that your following is great and your messages frequent that a simple note written on a piece of paper may seem meaningless, but what if it is not? Matt fingered the page thoughtfully.